RANGERS’ recent impressive run was brought to an end, as Derby County inflicted defeat on Ian Holloway’s men for the first time in five Sky Bet Championship fixtures. In truth, it was no more than the Rams deserved in Gary Rowett’s first home match in charge. They were dominant for much of the game and the hosts' pressure finally told in the 70th minute – Matej Vydra smashing home from close range to earn Derby victory at Pride Park. 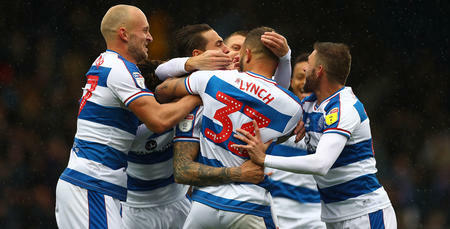 Following the two-week international break, Holloway made four changes to his QPR side that emphatically overcame Rotherham United 5-1 at Loftus Road a fortnight ago. Ryan Manning, James Perch, Conor Washington and Pawel Wszolek all came into the starting XI, at the expense of Massimo Luongo, Joel Lynch, Yeni Ngbakoto and Idrissa Sylla. Ngbakoto and Sylla started among the substitutes, while Lynch and Luongo sat out altogether, the latter following his recent international exploits with Australia. There was also a welcome return to the bench for full-back Jack Robinson, following a four-month lay-off with injury. In the same 3-5-2 formation that was deployed against the Millers, QPR lined up as: Alex Smithies; Nedum Onuoha, Grant Hall, Perch; Darnell Furlong, Wszolek, Manning, Luke Freeman, Jake Bidwell; Matt Smith, Washington. The first 10 minutes of this contest made for a close encounter, with both Smithies and his opposite number, Scott Carson, untroubled in their respective goals. Yes, Derby probably enjoyed the better of the possession, though the R’s held their own very early on. The first real opportunity of the game arrived for Derby in the 14th minute. When Tom Ince slipped in Johnny Russell, the home midfielder raced into the left-hand side of the box before dragging a low effort only inches wide of the far post. Six minutes later, the hosts threatened again. Chris Baird crossed from the right and, when his out-swinging centre evaded Smithies, a stretching Russell was just unable to apply the finish at the back post. QPR’s first chance arrived in the 24th minute. Freeman found Hall in an advanced position, but the defender’s low, 25-yard attempt was comfortably held by Rams goalkeeper Carson. Derby, again through Russell, spurned arguably their best opportunity yet in the 27th minute. Vydra’s initial free-kick deflected into the path of Russell, but he could only shoot straight at Smithies. A minute later, two more home chances. First, David Nugent saw his 12-yard effort beaten away by Smithies, before Vydra stabbed wide from a similar distance. At the other end, Rangers’ Smith saw his distance effort deflect up into the arms of Carson in the 34th minute. But, in truth, Derby had now long been in control – and another Russell attempt, in the 38th minute, saw the Rams ace leap to head wide from Baird’s right-flank delivery. By now, the R’s were no doubt looking forward to half-time, hoping to remain level. Thankfully, they managed to do just that. Derby presented themselves with another chance a minute before the break, but Nugent hooked an effort past the upright from 20-yards out. Again, the Rams enjoyed a wealth of time on the ball at the beginning of the second period – and they should have capitalised on a Rangers mistake in the 53rd minute. Furlong surrendered possession to Russell in his own half but would ultimately atone for that blemish, as he slid to block Russell’s shot when the latter delayed in the box. The home side continued to press and, come the 58th minute, Holloway decided to change things in order to stem the tide. Wszolek made way for Sean Goss. That was followed by another sub 10 minutes later, as Ngbakoto replaced Washington. Unfortunately, those changes couldn’t halt Derby from eventually taking the lead in the 70th minute – and you couldn’t say it wasn’t coming. Smithies saved Ince’s initial low blast but he couldn’t keep out the hosts just seconds later, as Vydra pounced on the rebound to smash home from close range. Now a goal down, Holloway threw on his final sub 14 minutes from time, as Sylla was introduced for Furlong. Despite being outplayed for large spells, Rangers twice went mightily close to equalising in the 88th minute. Smith’s 20-yard attempt was tipped around the right-hand post by Carson and, just moments later, sub Sylla should have scored from Freeman’s subsequent corner kick. The Guinea international's header struck the left post before spinning out of play. Four minutes of stoppage time were added on at the death and, two minutes into it, Smith also headed wide from Manning’s lofted delivery. However, a levelling goal wasn’t ultimately forthcoming, as Derby held on for the win their performance warranted.